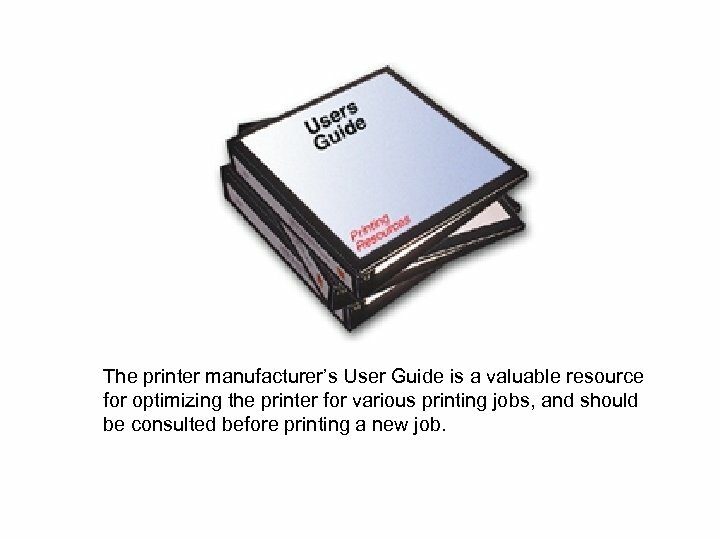 The printer manufacturer’s User Guide is a valuable resource for optimizing the printer for various printing jobs, and should be consulted before printing a new job. The output resolution and the type of paper that is selected in the printer driver will effect the sharpness and detail in the final print. 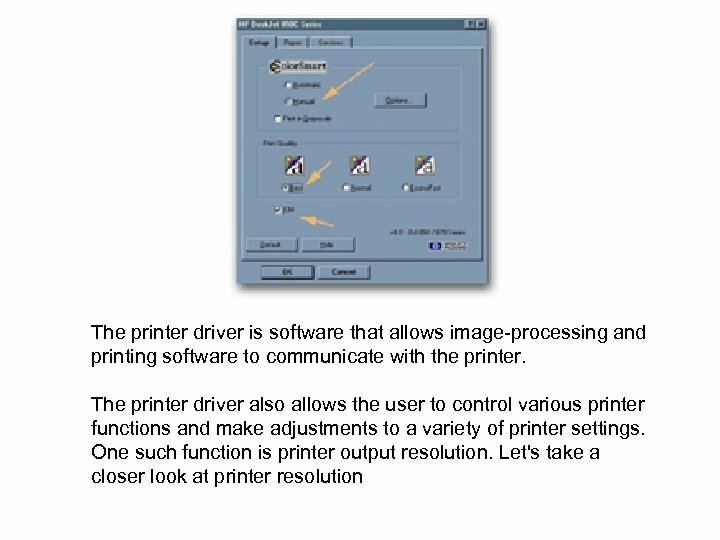 The print driver controls much more than just the printer’s resolution. 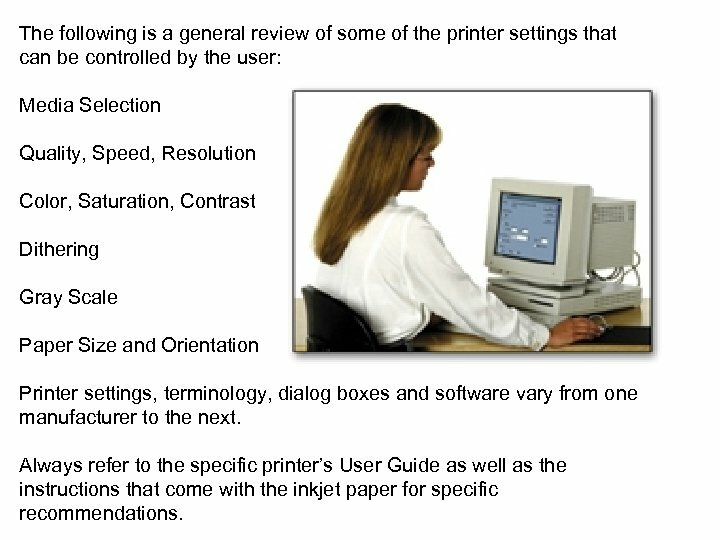 The following is a general review of some of the printer settings that can be controlled by the user: Media Selection Quality, Speed, Resolution Color, Saturation, Contrast Dithering Gray Scale Paper Size and Orientation Printer settings, terminology, dialog boxes and software vary from one manufacturer to the next. 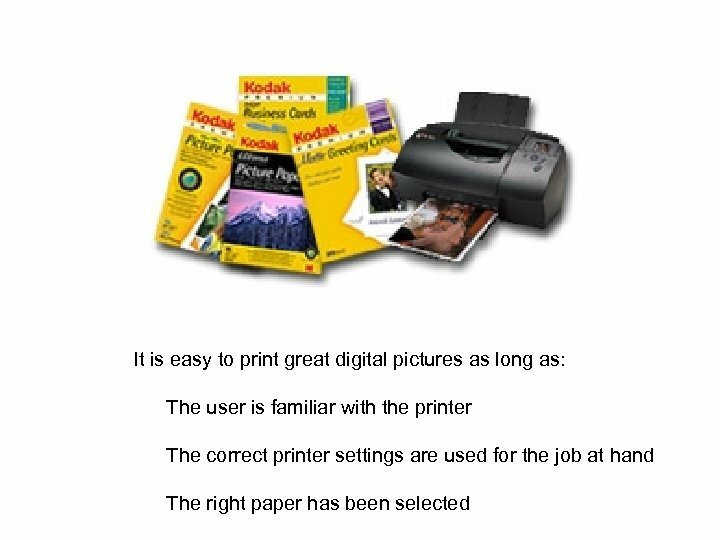 Always refer to the specific printer’s User Guide as well as the instructions that come with the inkjet paper for specific recommendations. 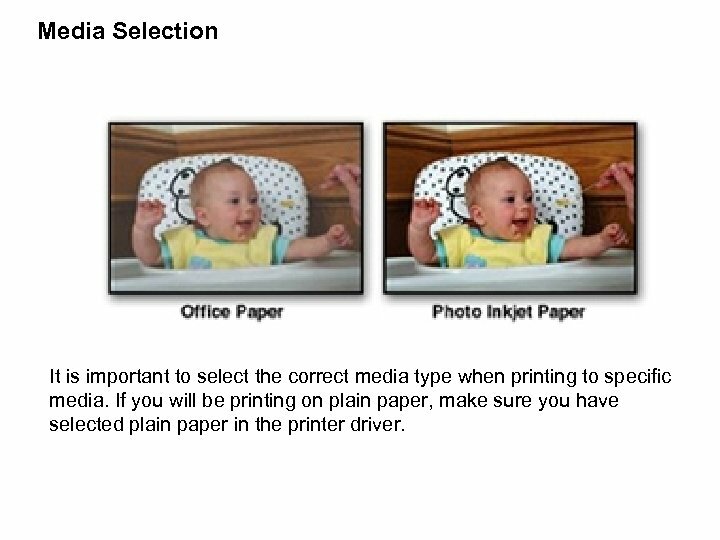 Media Selection It is important to select the correct media type when printing to specific media. If you will be printing on plain paper, make sure you have selected plain paper in the printer driver. 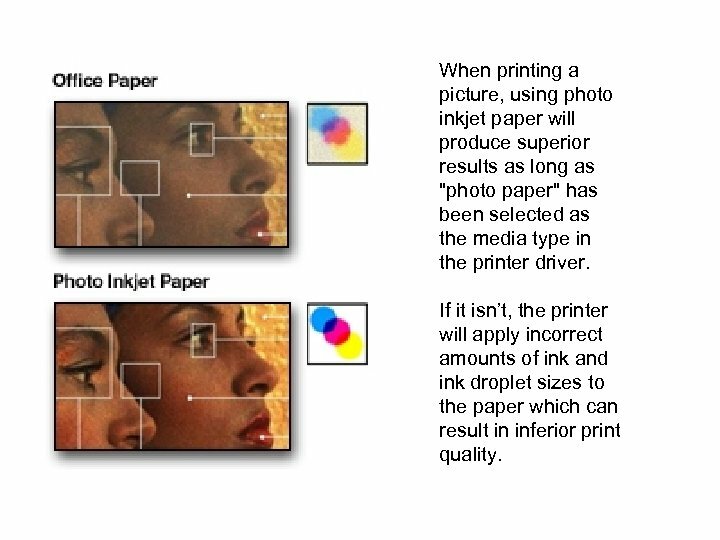 When printing a picture, using photo inkjet paper will produce superior results as long as "photo paper" has been selected as the media type in the printer driver. 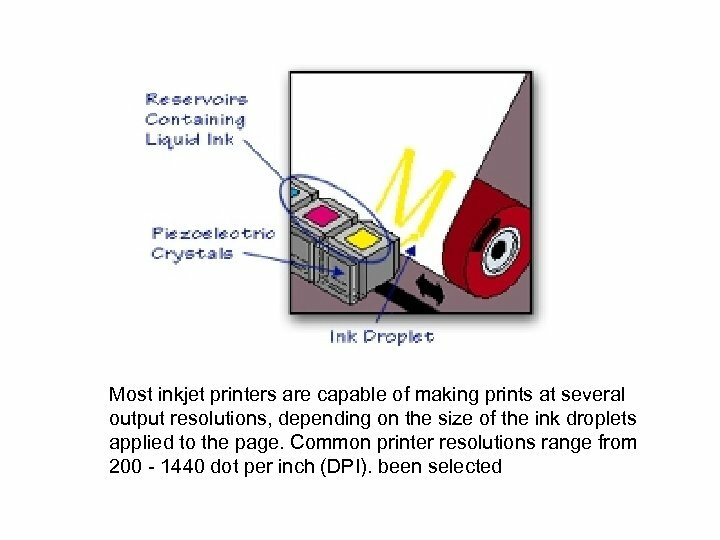 If it isn’t, the printer will apply incorrect amounts of ink and ink droplet sizes to the paper which can result in inferior print quality. 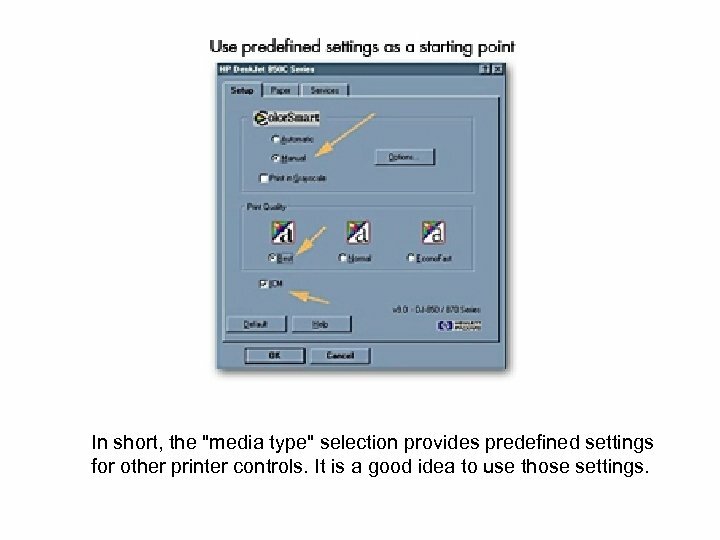 In short, the "media type" selection provides predefined settings for other printer controls. It is a good idea to use those settings. Quality, Speed and Resolution Most printer settings are interrelated. One setting option effects another. For example, the "media type" settings will often include manufacturer’s recommend default settings for quality, speed, and resolution. 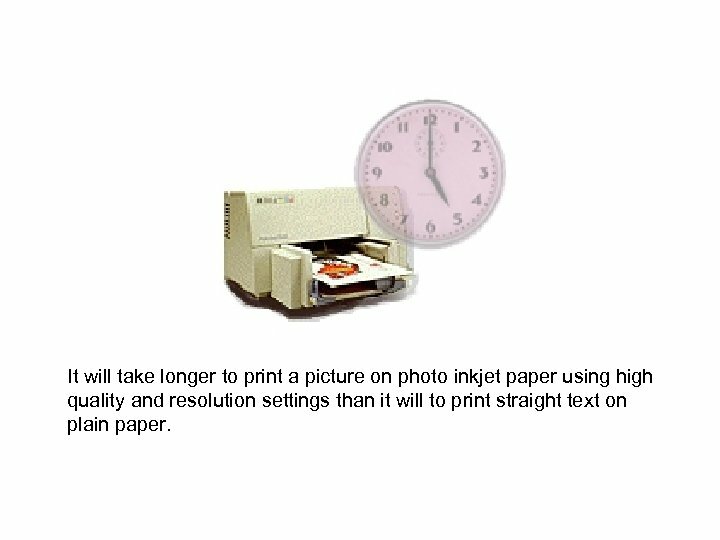 It will take longer to print a picture on photo inkjet paper using high quality and resolution settings than it will to print straight text on plain paper. 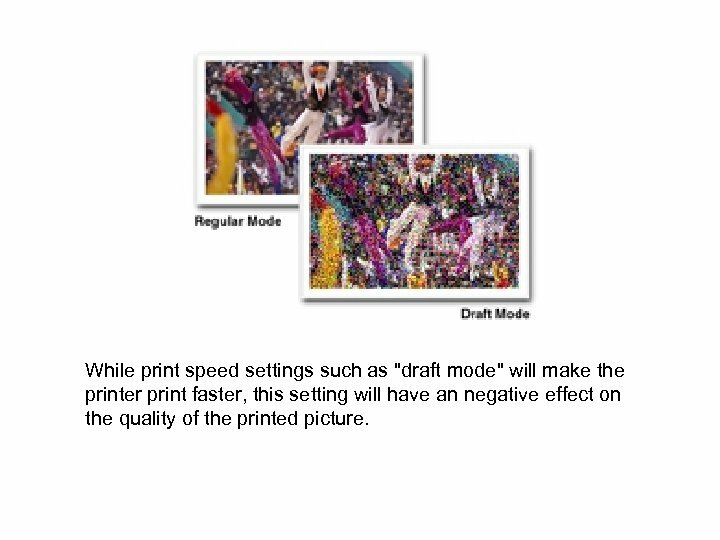 While print speed settings such as "draft mode" will make the printer print faster, this setting will have an negative effect on the quality of the printed picture. 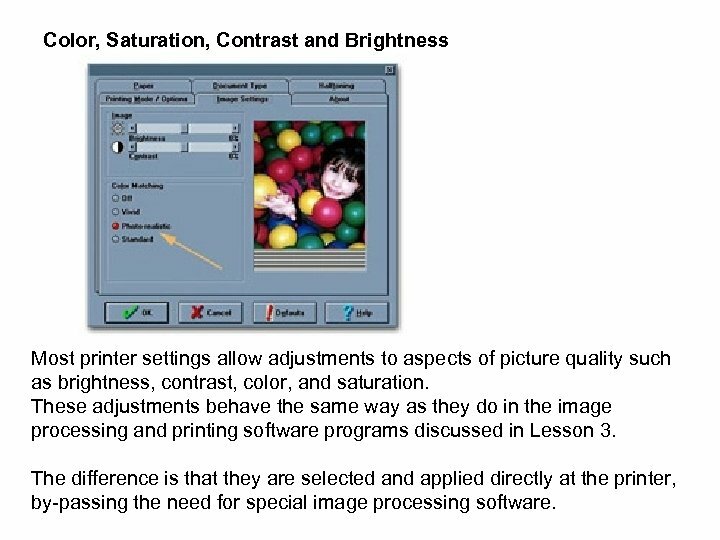 Color, Saturation, Contrast and Brightness Most printer settings allow adjustments to aspects of picture quality such as brightness, contrast, color, and saturation. These adjustments behave the same way as they do in the image processing and printing software programs discussed in Lesson 3. The difference is that they are selected and applied directly at the printer, by-passing the need for special image processing software. 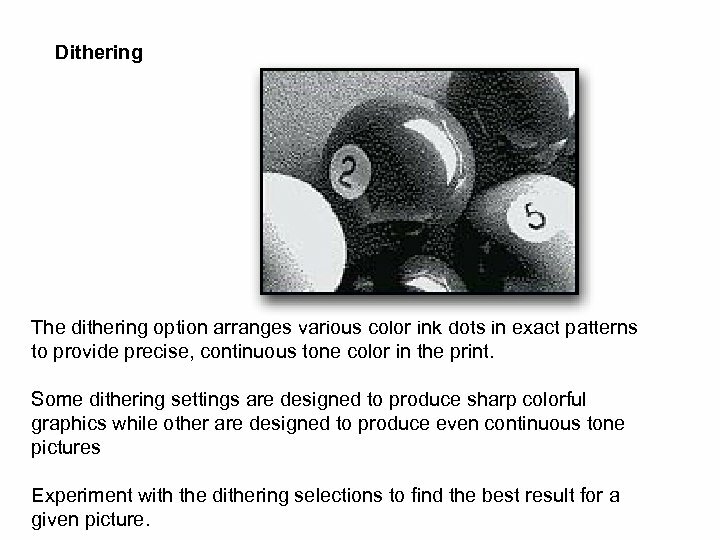 Dithering The dithering option arranges various color ink dots in exact patterns to provide precise, continuous tone color in the print. Some dithering settings are designed to produce sharp colorful graphics while other are designed to produce even continuous tone pictures Experiment with the dithering selections to find the best result for a given picture. 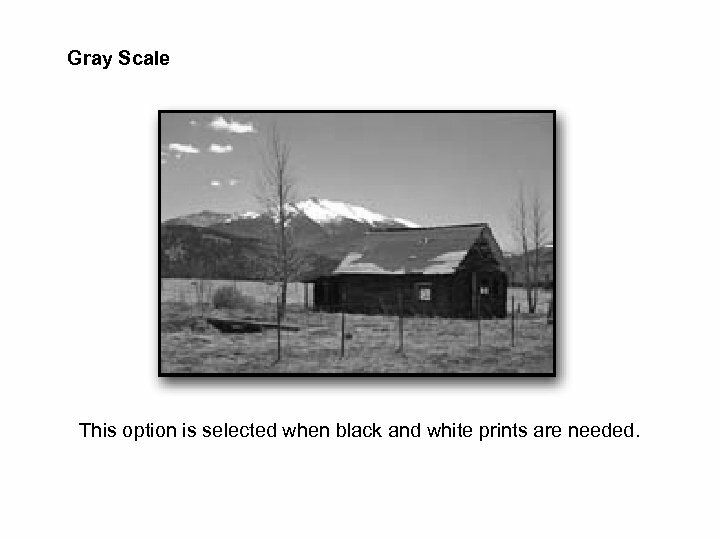 Gray Scale This option is selected when black and white prints are needed. Paper size and Orientation Printer drivers determine the printer’s ability to accept different paper sizes. 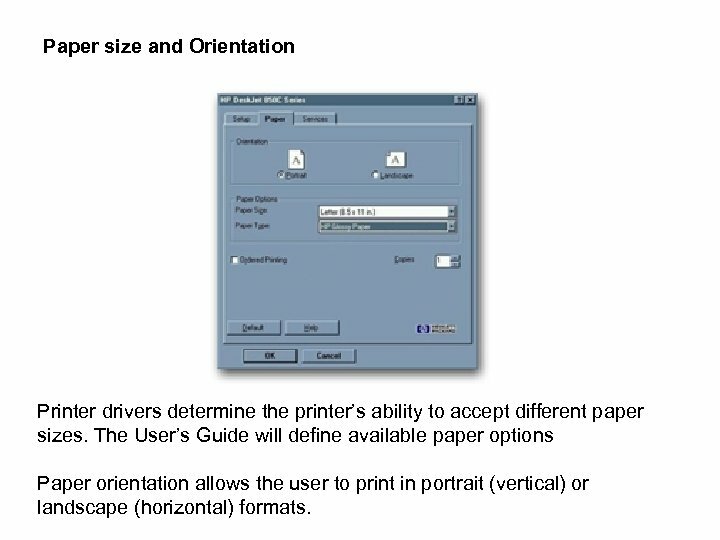 The User’s Guide will define available paper options Paper orientation allows the user to print in portrait (vertical) or landscape (horizontal) formats. 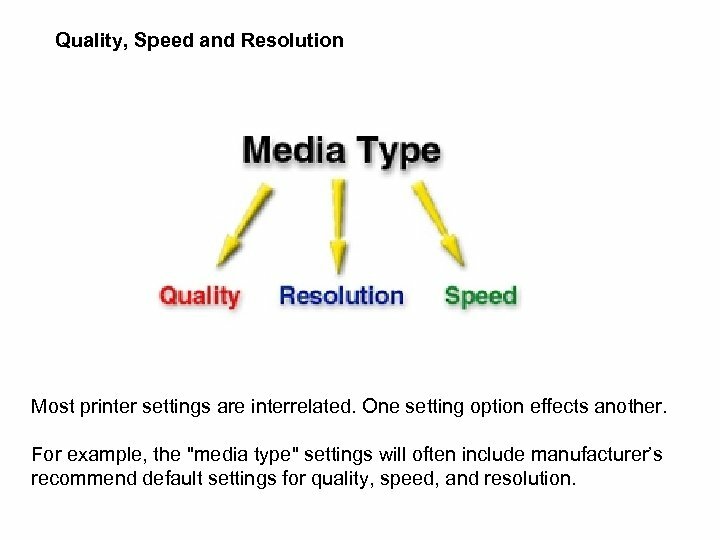 Printer settings, media recommendations and terminology, vary by print. 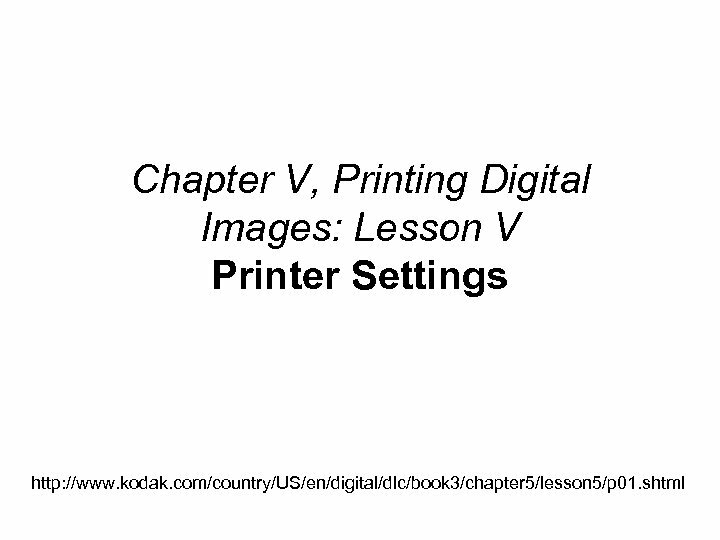 The printer and media User Guides are good resources for choosing correct printer settings. 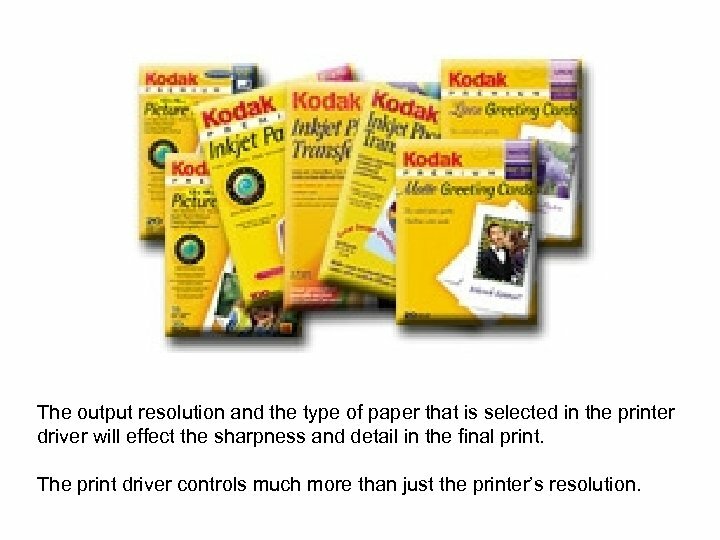 Additionally, the KODAK Inkjet media web site at http: //www. kodak. 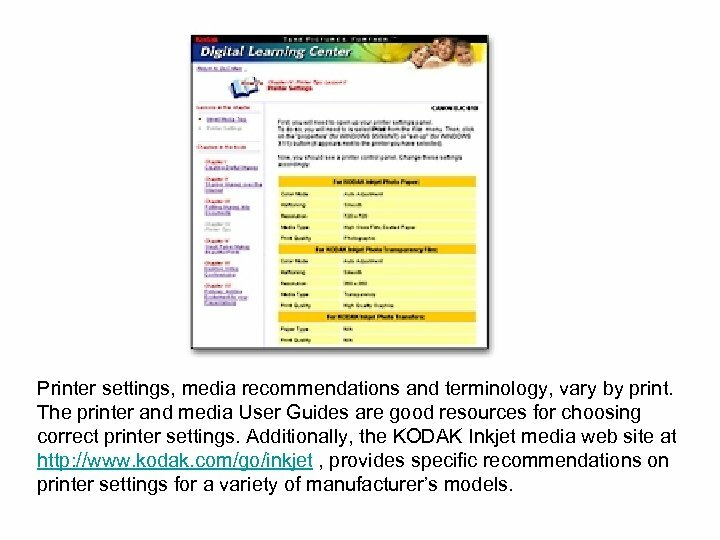 com/go/inkjet , provides specific recommendations on printer settings for a variety of manufacturer’s models. 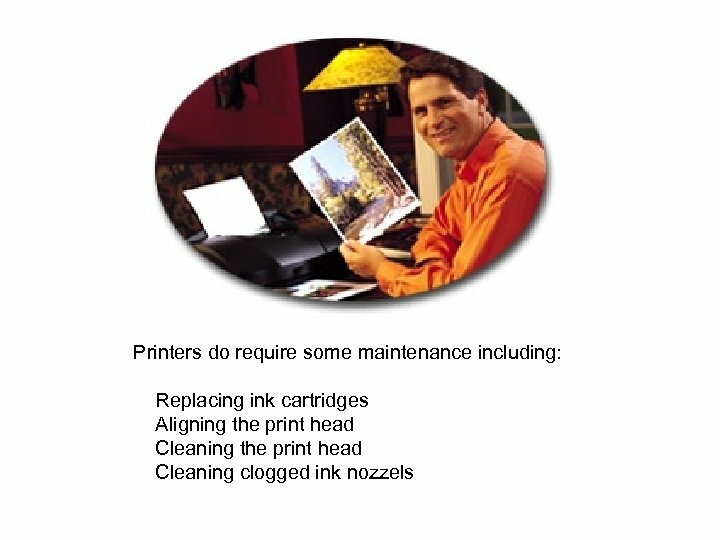 Changing an Ink Cartridges need to be changed when they run out of ink or if the ink becomes too old to produce good results. Most ink cartridges will contain a "Use before" date printed on the box. Some printers have ink status indicator lights showing the amount of ink left in each cartridge. 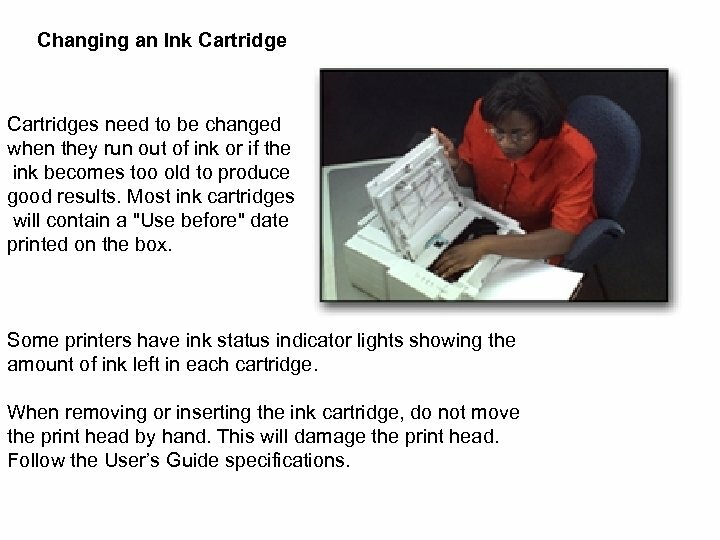 When removing or inserting the ink cartridge, do not move the print head by hand. This will damage the print head. Follow the User’s Guide specifications. Aligning the Print Head Aligning the print head is often a step in changing an ink cartridge. If prints show mis-aligned vertical lines particularly in printed text, it’s time to realign the print head. The procedure for aligning the print head varies by printer manufacturer and printer driver software. Refer to the User’s Guide. 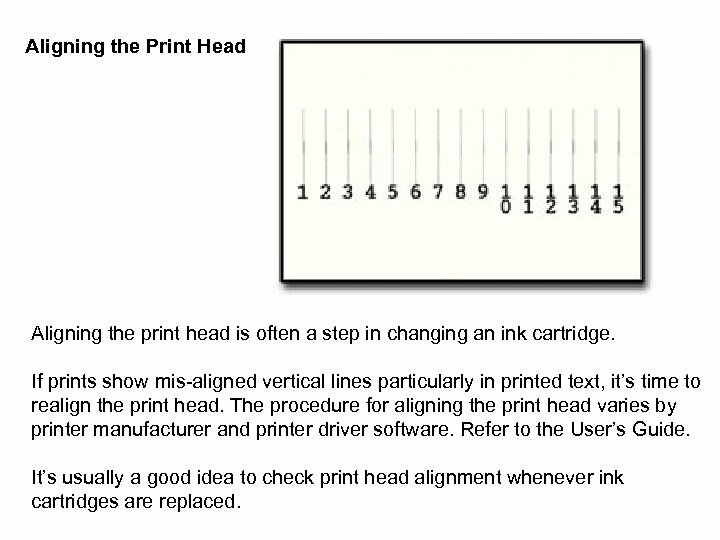 It’s usually a good idea to check print head alignment whenever ink cartridges are replaced. 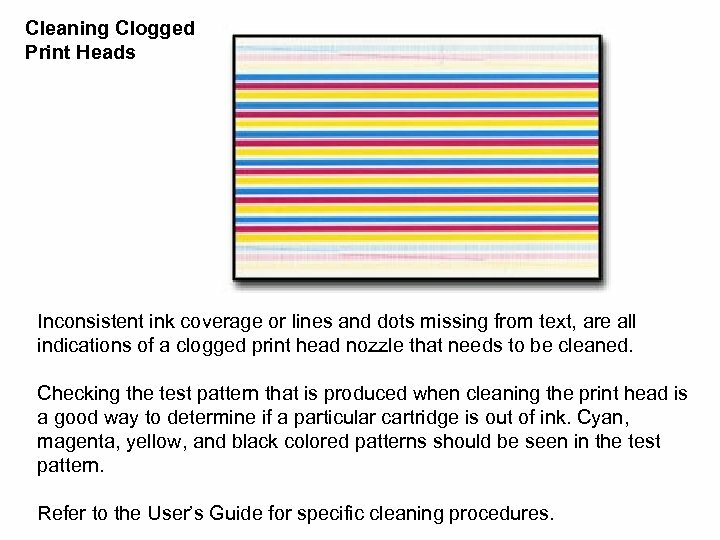 Cleaning Clogged Print Heads Inconsistent ink coverage or lines and dots missing from text, are all indications of a clogged print head nozzle that needs to be cleaned. Checking the test pattern that is produced when cleaning the print head is a good way to determine if a particular cartridge is out of ink. Cyan, magenta, yellow, and black colored patterns should be seen in the test pattern. Refer to the User’s Guide for specific cleaning procedures.